Babylonian amora of the third generation; contemporary of Rabbah b. Huna, with whom he was closely associated. The latter visited him at his home (Shab. 119a), and once sent him a question, addressing him with the words, "May our teacher teach us" (Yeb. 25a). These friendly relations, however, were subsequently disturbed, for Rabbah b. Naḥman once had some of Rabbah b. Huna's trees cut down because they stood on the banks of a river and interfered with the river traffic. When Rabbah b. Huna heard of this he cursed Rabbah b. Naḥman: "May the offspring of him who caused these trees to be cut down be uprooted." 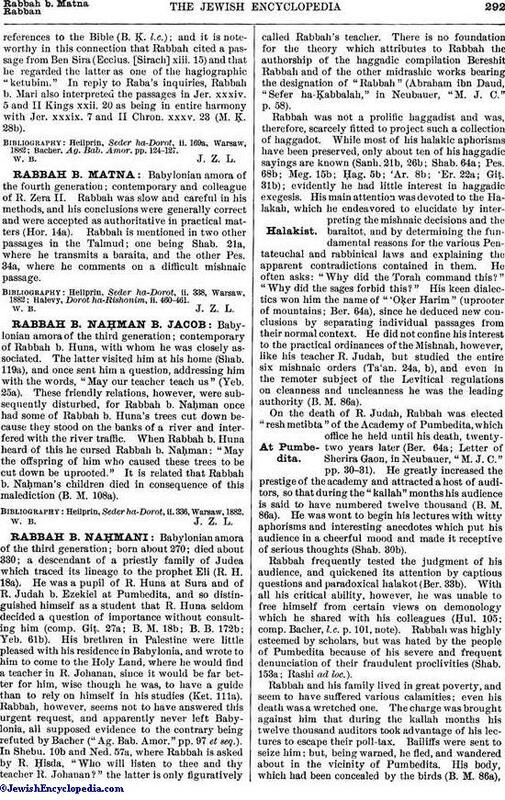 It is related that Rabbah b. Naḥman's children died in consequence of this malediction (B. M. 108a). Heilprin, Seder ha-Dorot, ii. 336, Warsaw, 1882.